Hello all! The summer Massage Program class schedule is now posted. It is not available yet on the main LCC site, for registration purposes, but you can check it out and plan for your future by clicking here! Please take note: we are mixing things up this summer and trying “intensive” sections in many courses, meaning that classes will run twice a week in either the first or last five weeks of the term. You will need to plan accordingly, keeping in mind that the same amount of material will be presented in a compressed format. That’s twice the studying and homework in half the time. There are advantages, of course, such as the chance to take half the summer off from school, or the opportunity to complete classes in a series that would normally take two terms to complete. So, have a look at the schedule and begin to plan for what will work best for you! when will the summer CRN numbers going to be available? i want to register and can’t find them anywhere! 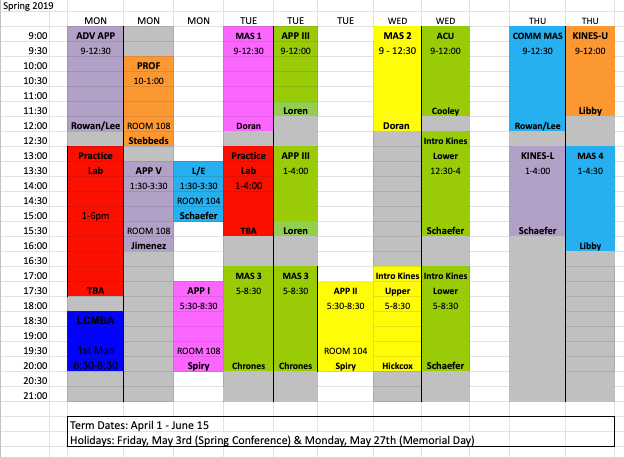 CLICK FOR THE SPRING 2019 SCHEDULE! Are you interested in starting the Massage Program? Please plan to join us for an Informational Meeting! Click here for the next date. Oregon state licensure requires 625 hours of education. Click for more. Click to learn about scholarships for which you may be eligible! Click for a schematic that will help you prepare for completion & testing!